Deer are definitely not predators nor are they scavengers. Deer are ruminants (of the hoofed, cud-chewing species of mammal) and have a complex digestive system like cows. Their multi-chambered stomachs rely on microorganisms instead of digestive juices to break down food in order to absorb nutrients. These microorganisms are specific to various food types, so if a deer changes its eating habits, it could take several weeks for these microorganisms to adjust to the new food source, which results in a reduction of nutrients absorbed. This white-tailed herbivore loves to leisurely graze on all types of plant matter including leaves, nuts, twigs, grass (providing less than 10% of a deer's overall diet) and more. So if you spot a white tail deer on your hike through the woods, you can be sure the animal is out foraging for food. Every day as I travel to work in the wee hours of the morning, I must exercise caution while traveling the roads through some wooded areas. Mostly nocturnal, deer usually graze in these woods and on the roads. They'll not only graze on plants, but they're even interested in fungi. Their diet, however, doesn't remain the same throughout the entire year. 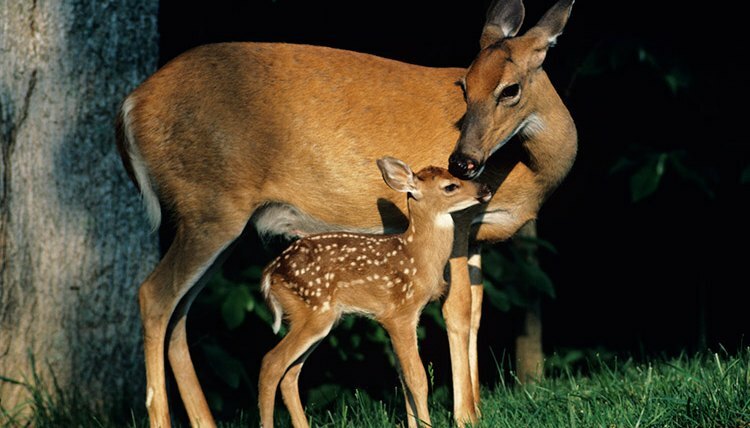 Deer will eat what is readily accessible, but during the winter months, food becomes increasingly difficult to find. Deer will then eat a variety of different things like buds, shoots and even bark. But bark or other woody browse (woody species of plants such as cedar elm, four-wing saltbush, etc.) are hardly enough to sustain deer even when their metabolism is low. White Cedar is one exception, but locating 3 to 6 pounds daily for 100 days can prove to be quite a task. Another winter menu item deer like is called "Old Man's Beard," which is a grey lichen somewhat like Spanish Moss. Usually found growing on dying or dead spruce and balsam trees, these part lichen, part fungi growths are rich in nutrients that can aid deer in surviving the harsh winter months. Food scavenging in agricultural fields have deer on the lookout for corn, soybeans or cowpeas that may have settled on top of the snow. Standing stalks will be avoided as they don't like plucking food from them. Deer will scavenge a harvested field for hours on end and basically ignore the standing stalks! As the warmer months approach and food becomes more accessible, the deer's diet usually consists of nuts, corn and acorns, plus an abundant amount of greens. Deer love some types of food that are not necessarily available all the time. Food they absolutely love are: pecans, hickory nuts, beechnut acorns, as well as acorns. Fruits such as apples, blueberries, blackberries, and persimmons are also appealing to deer and satisfy their appetites. As a matter of fact, a lot of things appeal to deer, so if you live near a wooded area, don't be surprised to see your flowers, vegetables or ornamental trees nibbled on by these gentle but skittish creatures who eat quickly then move onto another area for a quick repast! Mom.me: What Do Deer Love to Eat? Grand View Outdoors: What Do Deer Eat In Winter? Buck Manager: What Do Deer Eat? Tom Matteo has been a freelance writer since 1992. He specializes in hardware and software reviews for computers and gaming systems, and occasionally writes about such topics as animal behavior and care. Tom resides in Bethlehem, PA with his wife Tina and his beloved cockapoo, Angel.